In a move that was successfully kept secret, for the most part, until late last week when the first rumor whispers were widely repeated, AMD is making an unprecedented, near-term adjustment to its technology roadmap. As soon as the first half of next year, the company now plans to introduce into the desktop CPU market a new line of Phenom triple-core processors, whose architecture was christened with the code-name Toliman just hours ago. The existence of Triple-Core Phenom was revealed to members of the press this evening at a special West Coast press briefing late today. "Normally we do not make a press announcement or do analyst's briefings on a roadmap update," AMD's Desktop Division brand manager Simon Solotko told BetaNews, "but this roadmap update includes a change which we have withheld from the market primarily due to competitive reasons. AMD had an opportunity which we've known about for some time to provide an exciting product in the market, and we have decided at this point to come forward with our plan to release that product." It is essentially the same processor as AMD announced last May, but with one fewer core. During that May introduction, AMD told reporters it was now perceiving the desktop computer market as four segments rather than the typical three (value/mainstream/performance). That fourth segment falls in-between the third and fourth tier, and represents a customer who's willing to pay more for better multimedia performance and faster applications, but who isn't necessarily a system builder or a gamer. "There exists an attractive area - what I'll call 'high-end mainstream,"' said Solotko, "that we predict will exist well throughout '08 and into '09, at extremely attractive price points." The product is so new that no diagrams or test results exist for it yet, but as BetaNews was told, think of the company's "true quad-core architecture" for Phenom, and simply X out one of those cores. You might think that wasn't possible, given what was known to date about the company's crossbar switch architecture - a design innovation AMD introduced as far back as 2002 with its single-core Athlons, even when a second core didn't exist yet. AMD already had a dual-core rendition of its quad-core "Agena" and "Agena FX" Phenom processors slated for the first half of 2008. But Solotko told BetaNews that the company saw a significant opportunity to fill a gap in its product offering, since its lowest-frequency quad-core Phenoms won't exactly dovetail with its highest-frequency dual-core Athlons. Like the quad-cores, the Triple-Core Phenom will feature support for DDR2 memory, a shared 2 MB of L3 cache (which is important - the shared cache size is not reduced) and 512 KB of L2 cache per core. But unlike the company's last single-core processors which are also due out in December (the last of AMD's CITIES core design), its new triple-cores will support Socket AM2+. 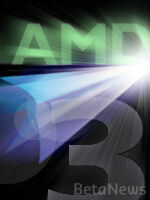 AMD offered no details today about frequency breakdown, projected performance, or most importantly, price. But Simon Solotko was willing to say that this may not be the only surprise up the company's sleeve. We asked him whether the Phenom rollout would now mirror the Barcelona rollout, starting with the low-frequency and low-power models first and holding off the high-performance models until later. Solotko said no. "None of those early market dynamics would be applied to triple-core," he responded to BetaNews. He then asked the next question himself, and then answered it: "You could ask that question about Phenom quad-core, and my answer to that question would be, I believe that we would have additional good news and surprises as we move closer to market. The Phenom, I think this is one piece of news that we're excited to deliver, and I think we'll have more good news when Phenom comes to market."